Lasts up to 28 shampoos. All-over color from a formula with a fortifying ingredient complex. Natural Instincts for Men fights gray in 10 minutes for healthy-looking hair color. The formula with vitamin E and aloe restores your natural color — and you get hair that is totally natural-looking. 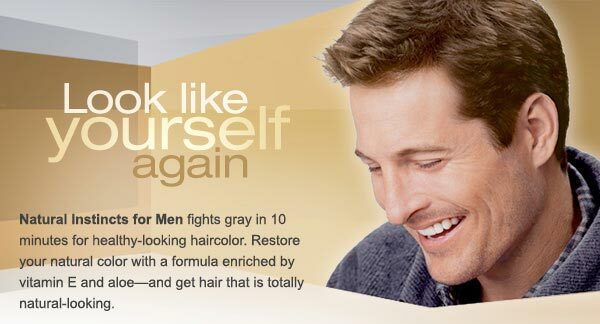 Natural Instincts for Men fights gray in 10 minutes for healthy-looking hair color. The formula with vitamin E and aloe restores your natural color  and you get hair that is totally natural-looking. The color on the box represents the color you are adding to your hair, so remember this simple formula: your current color + your best Natural Instincts shade = your new, natural-looking color. For best results, stay within two shades of your natural hair color. Perm first, then colorin the same day! A. Put on the Professional Men’s Gloves provided. B. Tear off and discard tab from the Developing Lotion bottle-2. Unscrew the cap from the Developing Lotion -2. C. Open the No Ammonia Colorant-1 and pour the entire contents into the Developing Lotion-2. D. Put the applicator bottle cap back onto the Developing Lotion-2. E. Place gloved finger over the open tip, point away from face, and shake well until the color is totally blended and the mixture thickens. F. Apply the color to your dry hair immediately. ONCE MIXED, NEVER RESEAL OR STORE THE COLOR IN A CLOSED CONTAINER AS IT COULD BURST. If you are applying color to both your facial and head hair, apply color to your beard, mustache, sideburns and temples first. For facial application, use product before shaving. Squeeze applicator bottle to apply mixture onto hair. Saturate your facial hair using a small amount of the product, avoiding eyebrows and eyelashes. If any color gets on your skin or household surface, wipe it off immediately with a damp cloth. Use the balance of the product on your head immediately. When covering gray, start where you have the most gray. Work gently and thoroughly through hair to ensure even distribution. Start timing after you have applied product to both your facial and head hair. Wait 10 minutes. For more resistant gray, leave on for up to 20 minutes or for the time indicated by the Strand Test. Wearing gloves, rinse hair until water runs clear. Apply a small amount of the Color Conditioning Treatment -3 evenly to your hair. For best results leave on for 2 minutes, then rinse thoroughly with warm water. Use the Color Conditioning Treatment weekly to infuse hair with shine and actively help protect it from damage. Don’t worry if the color of the mixture on your hair looks different from your desired color. Wait 24 hours before shampooing to prevent color loss. You will need a small plastic bowl, plastic spoon, and an old traditional toothbrush. Use an old towel to protect clothing. Have a clock handy for timing. Developing Lotion: Unscrew the top of the Developing Lotion applicator bottle (do not remove the white applicator tip cover). Pour approximately 1/4 of the developing lotion (0.5 Fl. Oz.) into a small plastic cup or bowl. Tightly recap the developer bottle. No Ammonia Colorant: Unscrew the top of the No Ammonia Colorant bottle. Pour approximately 1/4 of the No Ammonia Colorant (0.5 Fl. Oz.) into the small plastic cup or bowl. Tightly recap the No Ammonia Colorant bottle. Mix the product with a plastic spoon until thoroughly blended and the mixture thickens. The remaining unmixed product in the Developing Lotion bottle and No Ammonia Colorant bottle should be saved for the next facial hair application. For easy facial hair application, use an old traditional toothbrush. Please do not use the toothbrush for any other purpose. Apply the mixture to your beard, mustache, and if desired, sideburns or temples. Saturate your facial hair using a generous amount of product. Brush up and down to cover all hair evenly, including the hair underneath and closest to your skin. Be careful not to rub or scrape skin. While you are waiting, rinse off the plastic mixing spoon, toothbrush, plastic mixing cup or bowl with water and save for future applications. Wearing gloves, rinse product off with warm water until water runs clear. Save gloves for future applications. When gray hair begins to show again, reapply color (approximately every 4 to 6 weeks). This kit contains four applications if you are using the product for facial hair only. Rich, natural looking color and long lasting gray coverage. Our unique formula protects and conditions as it colors. Long lasting formula blends away even the toughest grays and restores your natural color. Superior conditioning to the leading men’s color. Get up to 4 weekly treatments to protect hair and seal in color. Leaves hair looking thicker, fuller • As easy as shampooing • No drip, no mess • Premium men’s gloves • For beard and mustache too! For healthy, totally natural looking color trust your instincts – Natural Instincts! If you choose a shade darker than your natural color, it will not wash out in 6 weeks. Enough colorant for one head and one facial application. What products does Clairol make? Clairol makes haircolor products. Choose from Semi-Permanent (lasts through 8-12 shampoos), Demi-Permanent (lasts through 28 shampoos), Permanent (lasts until your hair grows out or you recolor) or Highlighting & Blonding to help you become colorwonderful. Should individuals with natural, uncolored hair use different haircolor products than those who have previously colored their hair? It depends on the desired result. If you are coloring your hair for the first time and only want to enhance your natural color, try a Demi-Permanent (lasts through 28 shampoos) product close to your natural haircolor. 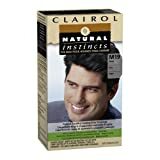 If you want to go lighter, you need to select a Permanent (lasts until your hair grows out or you recolor) haircolor, then refer to the insert that comes inside your box of Clairol haircolor and follow the instructions for first time application. Should people who want to cover gray hair use different coloring products than those who don’t need coverage? Most Clairol haircolor products will blend or cover gray hair to some degree. If you have a small percentage of gray (not very visible), use a Semi-Permanent (lasts through 8-12 shampoos) product, such as Loving Care. If you have a higher percentage of gray hair (up to 50%), use a Demi-Permanent (lasts through 28 shampoos) product such as Natural Instincts, which will blend away gray hair. On the other hand, if you have a lot of gray and want to cover it completely, use a Permanent (lasts until your hair grows out or you recolor) product. If you have 50% or more gray, use Nice ‘n Easy Gray Solution. How can I test-run a color before committing to coloring my entire head of hair? Strand test is a simple method for you to test haircolor on a portion of your hair before doing the entire application. (The instructions are in your haircolor box.) It’s an important step because it’s the only way to see exactly how the shade you selected works with your starting haircolor to achieve the resulting color. A strand test will also help you determine the exact timing you’ll need to color your whole head. Product instruction inserts are inside your haircolor box. Do the STRAND TEST to determine your optimal coloring time. Read this entire instruction leaflet before you begin. You have already experienced any reaction to coloring products. In these cases do not conduct the skin allergy test and consult a doctor before using any haircolor product. 2. PERFORM A SKIN ALLERGY TEST 48 HOURS BEFORE EACH PRODUCT USE even if you have already used coloring products before. You will need a cotton ball or swab, a plastic bowl and a plastic spoon. To open, unscrew the entire Developing Lotion cap (Bottle #2). (Don’t pull off the tab.) Then unscrew the No Ammonia Colorant cap (Bottle #1). Mix small, equal parts of the No Ammonia Colorant and Developing Lotion in a plastic bowl. Apply mixture to a test area the size of a quarter in the bend of your elbow. Allow to dry. Use remainder for the Strand Test. Do not wash this area for 48 hours. During washing, protect with an adhesive bandage and remove it immediately after washing. Examine the test area during the next 48 hours. If no reaction occurs, you are ready to color. The absence of reaction to this test is no guarantee that an allergic reaction may not occur as a result of a future haircoloring process. However, this test represents an important precaution. Please consult a doctor if you have any doubts. NOTE: IF A RASH, REDNESS, BURNING OR ITCHING OCCURS YOU MAY BE ALLERGIC. STOP. YOU MUST NOT USE THIS PRODUCT. Any stinging or burning and/or rash, rinse immediately and discontinue use as this may be an indication of a more serious reaction. DO NOT color your hair again before consulting a doctor or seeking medical advice. Rapidly spreading skin rash, dizziness or faintness, shortness of breath and/or swelling eyes/face, rinse immediately and SEEK IMMEDIATE MEDICAL ATTENTION. IF AFTER COLORING OR ON THE FOLLOWING DAYS YOU EXPERIENCE problems, such as skin itching, skin rash, swelling to eyes/face, blistering and/or skin or scalp weeping SEEK IMMEDIATE MEDICAL ATTENTION. This product contains ingredients including hydrogen peroxide, which may cause severe eye irritation and possible permanent eye injury. If any product gets into your eye, flush immediately with a large amount of lukewarm water and seek medical advice. We recommend removing contact lenses before applying haircolor. If you must wear contact lenses during application and if any product gets into your eye, remove the lens first, then flush immediately with a large amount of lukewarm water and seek medical advice. Never use haircolor on eyebrows or eyelashes or if your scalp is irritated or injured. Do not use if your hair has been colored with henna or metal dyes. Remove all metal objects from hair before and during coloring. Keep product in a cool place away from heat and light. Do not mix this colorant with any other product. Do not keep any unused mixed product. Do not leave the mixture in a closed bottle (bottle may expand or burst). Keep all haircoloring products out of reach of children. Do the Strand Test each time you color to determine optimal timing and color results. Perms, relaxers, previous color, and the sun can affect your results and timing. You will need: scissors, tape and a clock. Cut a 1/4 inch wide strand from the darkest or grayest part of your dry hair close to the scalp and tape at the cut end. Completely cover the hair strand with the mixture remaining from the Allergy Test. Start timing. After 10 minutes (8 minutes for permed or relaxed hair), check the strand. If the strand is not the color you want, return it to the mixture and check the color every few minutes for up to 20 minutes. My timing for desired color: _______ minutes. Frost & Tip. Dramatic blonde highlights that enhance and brighten your natural color.